Phylogeny of expanded Malvales based on Bayer et al. (1999) and Alverson et al. (1998). 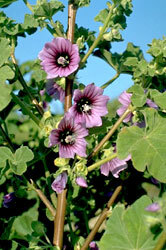 Core Malvales includes the taxa traditionally placed in the Bombacaceae, Malvaceae, Sterculiaceae and Tiliaceae. The order Malvales has traditionally included four core families, Bombacaceae, Malvaceae, Sterculiaceae and Tiliaceae, although various authors have included other families such as Cistaceae and Cochlospermaceae. Recent phylogenetic studies (e.g., Alverson et al. 1998, Bayer et al. 1999) have revealed that the four core families form a monophyletic group, termed here the core Malvales, and have identified ten allied families which are included in the expanded Malvales shown in the tree above. Together, these families contain approximately 4,000 species and range from small Mediterranean shrubs like Cistus to towering tropical trees like Shorea. The order also contains many economically important plants, such as Cola (the source of cola flavor), Bixa orellana (annatto, a natural red coloring), Theobroma cacao (the source of cocoa) and Gossypium (cotton) and Ochroma pyramidale (balsa wood). Many members of Malvales can be identified by the following combination of characters: leaves with palmate venation (often three principal veins arising from the base of the leaf blade), mucilage canals within the tissues (think of the slime in Okra), stellate (star-shaped) hairs on the vegetative parts of the plant and stipules (leaf-like structures at the base of the leaf stalk). The core Malvales clade has been consistently well-supported in molecular phylogenetic analyses as have the clades comprising Bixaceae+Diegodendraceae+Cochlospermaceae and Dipterocarpaceae+Sarcolaenaceae+Cistaceae. However, placement of the remaining families (Muntingiaceae, Sphaerosepalaceae, Thymelaceae and Neuradaceae) is still unclear. Muntingiaceae falls either in the Dipterocarpaceae+Sarcolaenaceae+Cistaceae clade (Alverson et al. 1998, Fay et al. 1998) or at the base of the Malvales (Bayer et al. 1999). Analyses by Alverson et al. (1998) place Sphaerosepalaceae basal in the Bixaceae+Cochlospermaceae clade (Diegodendraceae was not sampled in their analysis). In contrast, Bayer et al. (1999) found that Sphaerosepalaceae falls sister to Thymelaeaceae, but with weak support. Thymelaeaceae (+Sphaerosepalaceae) has been weakly supported as sister to the Dipterocarpaceae+Sarcolaenaceae+Cistaceace+Muntingiaceae (Alverson et al. 1998, Bayer et al. 1999). Finally, Neuradaceae seems most likely to belong at the base of the Malvales, although no studies have been able to place it with certainty. Alverson, W. S., K. G. Karol, D. A. Baum, M. W. Chase, S. M. Swensen, R. McCourt, and K. J. Sytsma. 1998. Circumscription of the Malvales and relationships to other Rosidae: Evidence from rbcL sequence data. American Journal of Botany 85:876-887. Bayer, C., M. F. Fay, A. Y. De Bruijn, V. Savolainen, C. M. Morton, K. Kubitzki, W. S. Alverson, and M. W. Chase. 1999. Support for an expanded family concept of Malvaceae with a recircumscribed order Malvales: a combined analysis of plastid atpB and rbcL DNA sequences. Botanical Journal of the Linnean Society 129:267-303. Fay, M. F., C. Bayer, W. S. Alverson, A. Y. de Bruijn, and M. W. Chase. 1998. Plastid rbcL sequence data indicate a close affinity between Diegodendron and Bixa. Taxon 47:43-50. The authors would like to thank Jay Horn for sharing his most recent analysis of the Malvales and for commenting on the status of the phylogenetic relationships. 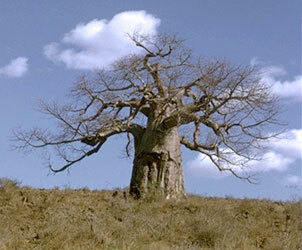 Page: Tree of Life Malvales. Authored by Stacey D. Smith and David A. Baum. The TEXT of this page is licensed under the Creative Commons Attribution License - Version 3.0. Note that images and other media featured on this page are each governed by their own license, and they may or may not be available for reuse. Click on an image or a media link to access the media data window, which provides the relevant licensing information. For the general terms and conditions of ToL material reuse and redistribution, please see the Tree of Life Copyright Policies.